The Premium Template has been designed to work on mobile devices. It is responsive and flexible, and no programming knowledge is required for its customization. The Premium Template is used by default in all promotions created with the Basic, Premium and White Label versions of the platform. Which browsers are compatible with the Premium Template? This five-minute video will show you how to customize the Premium Template and you'll also learn all the design setup options. We recommend you watch this video tutorial to get a better idea of how the template works. Header: This has a fixed height of 36px and is always visible. It’s composed of three elements: on the left, a mobile-style dropdown menu, and on the right, the share button and the brand’s social media buttons. These buttons can be configured from the My Networks module. The background: This is the same for all pages of the promotion. In the mobile version, this background adapts optimally, instead of disappearing like it does in the Basic Template. The main container: This is displayed on top of the background and is where the contents of each page of the promotion are included: header images, promotion texts, photos, videos, questions, and so on. The Premium design template is enabled by default in all types of applications created with the Basic, Premium and White Label versions. In addition, for promotions created with the Premium and White Label versions, you will have the possibility to configure the different elements of the template to customize the design to your liking. Note: The configuration of the different elements of the template is not included by default in the promotions created with the Basic version. It can be added to the promotion as an extension for $ 19USD / € 19. From the Promotion Management Page, click the "Editor" button. A. Colors: Choose the color of the texts and call to action buttons such as the main buttons and primary links. B. Typographies: Customize the primary and secondary promotion fonts. C. Buttons: Select the button style. By default, these are displayed as outlines, but you can also make them solid. Style: This can be dark or light. The style will also define the color of the header and the footer of the page. Opacity: You can also play with the level of opacity to achieve optimal integration with the background. Height: You can vary the height of the container and adapt it to the type of content introduced, or you can choose to have it occupy the entire screen instead. Position: You can position the container in the center of the screen, to the sides, up or down or in the corners. Color: Select a color for the background. Opacity: Set the transparency level of the color of the background. Image: Upload a wallpaper image of your choice. Position: If you upload your own wallpaper image, you can define the focal point of the image. Predefined: Use one of our predefined images and borders. For each of the promotion pages (Landing, Registration Form, “Thank You” Page, Participations Gallery, Questionnaire) you can set up the width and structure of the container individually if you wish. 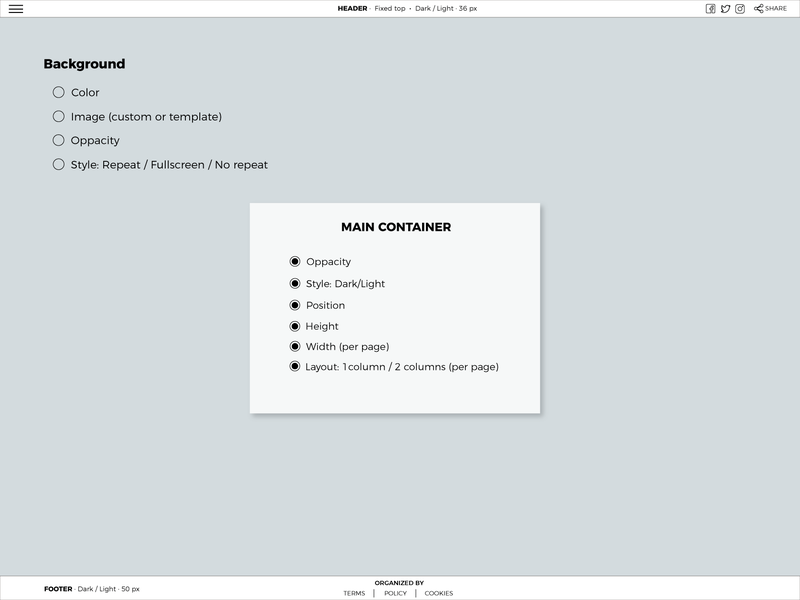 You can configure the container width. You can display the container in one or two columns. 4. Which browsers are compatible with the Premium Template?